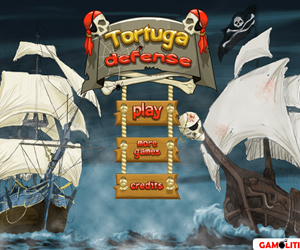 Tortuga Defense is unchallenging TD strategy on line game where you are defending your treasure from attacking ships. All towers can be easily upgraded after some experience and you can use waves to slow down the enemies and various towers such as: Canoneer, Artillery, Bucaneer, Grape Shot, Marksman, Man-O-War and Musketeer. The paths where enemies are passing are changing and geographical position can be used to attack enemies longer or twice. However with so many advanced towers, the game is boring and slow so not to recommend. anonymous: "tower defense games. good game."